In order to bring scientific awareness among the students and public, the National Science Day- 2018 celebrations started with various competitions held for students and teachers. The focal theme for this National Science Day was “Reaching the unreached through Science and Technology”. The “Elocution” competition for the students was held on 6-8 February 2018 for English Medium and vernacular language schools and junior colleges. 250 Students from 15 schools and 3 Junior Colleges participated in the Elocution competition. The participants were divided into three different categories as junior, senior and college students. The topic of Elocution this year was “Social media: boon or bane” for junior students and “Climate change and sustainability” for senior and college students. The “Sit & Draw” competition for the students attracts large participation and was held on 2 February 2018 on the topic “Idea for Bharat Nirman”. Nearly 250 Students from 20 different schools participated in this competition, which was again divided into three categories as sub-junior, junior and senior standards. The “Power Point Presentation” competition for teachers was held on 12 February 2018 on for English medium teachers, and on 15 February 2018for Marathi medium teachers on the topic “Reaching the unreached through Science and Technology”. 25Teachers from 10 Schools and two Junior colleges made a Power Point presentation on the above mentioned topic. The main exhibition of colorful posters depicting the “Science of Geomagnetism and Allied Fields” was held from 26-28 February 2018. A few posters depicting the theme of the National Science Day were specially prepared and displayed. 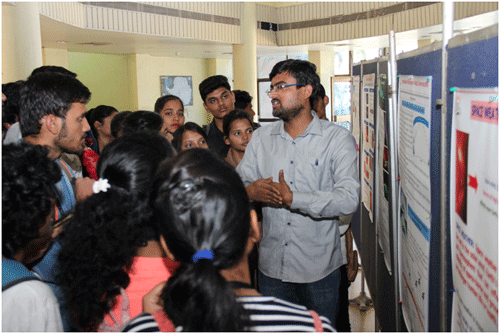 Various instruments used for Geomagnetism and Allied studies were displayed for the benefit of students. More than 1500 students and a large number of people from all walks of life visited the exhibition. Transport arrangements were made for schools expressing inability to bring the students to the Institute. Various audio-visuals on science related topics were highlighted and a number of popular talks were delivered during this period. Hands on experiments on “what can you do with a Magnet” and various science Models were also displayed. Science Quiz was held daily during the exhibition and spot prizes given to students. The main attraction for students and common public was the Solar Telescope. The students and public could have a view of the solar corona, sun spots, solar flares and prominences with the help of this solar telescope. The response from students and schools was phenomenal wherein almost four thousand participants competed for top spots. The footfall for exhibition of lay people was also encouraging. The Science Week celebrations culminated with popular science talk on “Walk that talks: Insights into cancer research” by the Chief Guest of the function, Dr. NishigandhaNaik, Director, Haffkine Institute, Mumbai. Dr. Radhakrishnamoorthy, IIT, Mumbai, our Guest of Honor also spoke on the occasion. Awards and Certificates to winners of the competitions were distributed at the hands of Chief Guest, Guest of Honor and Director, IIG, Dr. D. S. Ramesh during the valedictory function. The Science Day was also celebrated at our regional Centre’s “Equatorial Geophysical Research Laboratory (EGRL), Tirunelveli” and “Dr. KS Krishnan Geomagnetic Research Laboratory (KSKGRL), Allahabad” and all other magnetic observatories.